Managing Editor Josh Vanderwall says: Long, long ago, in October of 20 aught 13, I got into the Hearthstone closed beta. I played every single day for months and months, until I thought I couldn't play any more. It launched in March to general acclaim, and I found myself continuing my hours-a-day habit. As a two-decade Magic veteran, I wasn't expecting the hyper-simplified Hearthstone to really keep my attention for that long, but the constant shifts in the meta game, the always-random Arena runs, and battling up the ladder for rank kept me coming back. Just a few months after its successful launch, the single-player Adventure, Curse of Naxxramas, hit, challenging players to take down bosses of various difficulties, who refused to play by the rules. The different wings rolled out weekly, with new and exciting challenges for players at every turn. The balance was superb, with regular matches often taking a few tries, but ultimately being beatable, and the Heroic versions taking dozens of attempts in some cases. Fast forward to December, and the first proper expansion, Goblins vs Gnomes launched, bringing with it all kinds of randomness that has potential to really change how you play. Featuring new mechanics, new Minion types, and a penchant for silliness, GvG highlights Hearthstone's "fun-over-all" mentality, while offering some truly powerful cards for the more competitive-minded player. 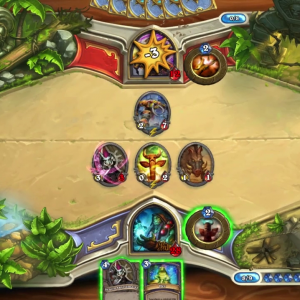 Hearthstone is something of a gateway game for to-be strategy enthusiasts, and we couldn't be happier to name it the Best Strategy Game of 2014. Next up, Best Action/Adventure of 2014. Click here!